Midinari Gurruwiwi was an exceptional and prolific bark painter from the Blue Mud Bay area of Northeast Arnhem Land. The aim of this article is to assist readers in identifying if their bark painting is by Midinari Gurruwiwi. It compares examples of his work. He painted in a Yirrkala / Northeast Arnhem Land style. If you have a Midinari Gurruwiwi bark painting to sell please contact me. If you want to know what your Midinari Gurruwiwi painting is worth to me please feel free to send me a Jpeg. I would love to see it. Midinari Gurruwiwi works are different to many Northeast Arnhem Land artists. He often uses small dots to infill areas. His rarrk crosshatching is fine but he often leaves large areas of single bold color. Mithinari’s paintings have a diversity of forms but also have an overall coherence of stylistic elements. He often repeats figures be they of fish or birds or snakes. Many of his paintings are of the inland area of Garrimala. This area is bursting with the vibrant life of the rich inland lake as snakes, birds and fish compete with each other among the waterlilies. This feeling of plenty is reflected in his paintings of this area. 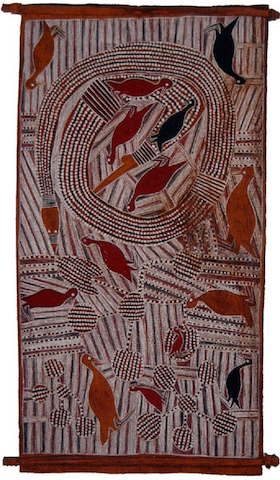 Most of his works incorporate his totems such as the Brolga and snakes. Many of his works also have water lilies. His figurative works are rare but where he does paint figures they have exaggerated body length. Mithinari continued working with brushes made of frayed stringy bark. He infilled the design with brushes made of human hair or from the midrib of a palm frond. Midinari painted with great speed and surety of hand. He has very thin frames of color around his works and adapted his compositions to the size of the bark. Midinari was born around 1929 in the Blue Mud Bay area. He learned to paint as a young man, with a group of Dhuwa moiety artists. He learned from the master bark painter Mawalan Marika along with Wandjuk Marika at Beach Camp in Yirrkala. Mithinari belonged to the Galpu clan. 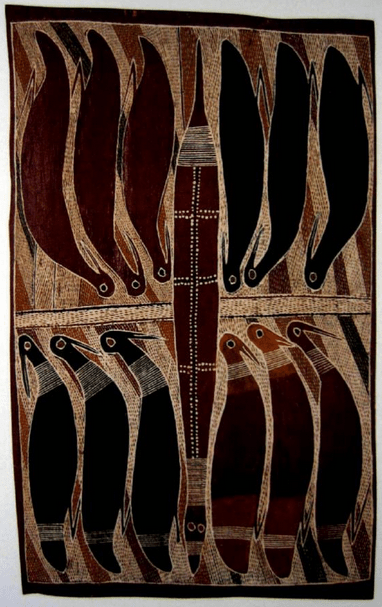 Midinari was one of the painters of the famous Yirrkala Church panels. He painted the panels alongside other renowned artists like Mathaman Marika and Mawalan Marika. The panels are now housed in the Buku-Larrnggay Museum.